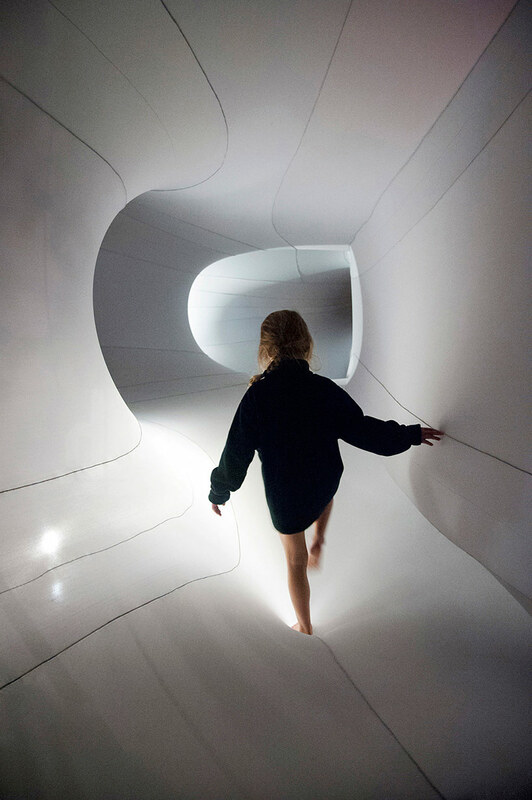 Sophia Chang, an American architect and former member of the SHIFTboston team, has created an interactive, cavernous-like installation entitled “Suspense” at the Invivia Gallery in Cambridge, MA. Stretched lycra fabric creates curving walls that blur the boundaries between interior and exterior space. Occasionally the fabric breaks to expose elements in order to frame both people and space in disorienting, new ways. Meghan: Can you explain your design process and how the form developed? Did it come from seeing the space first, as a way to contrast the existing building through material expression and experience? Sophia: One of the exciting aspects of working with installations is that these compact spaces can be an intensification of architectural experience. The results have always been a proof to myself of how powerful architecture in its space-making potentials can be. This is something to which people are generally unaware. For the most part, people don’t think about how the built environment is impacting the way they move or live. Many people I’ve encountered assume that architecture is about “making pretty buildings”, as if aesthetic considerations were the only ingredient buildings had to work with. “Suspense” not only creates an alternate experience to the ordinary, which makes people more aware of their own bodies in space, it also grabs onto and reframes the familiar, defamiliarizing the everyday for reconsideration of how that too affects our experience. I began by looking at this more familiar context where I would be intervening. What did I want to frame, and what were potential sequences that people would move through the project? Materiality was certainly part of the equation as only certain forms can be held through pure tension, but I had the intention of using fabric even before having seen the site. Lycra engages people’s sense of touch and allows people to interact with each other through walls, sometimes using the walls themselves. Shadows pass through from one side to the other, and and the object itself is changed by the action of people within the gallery. The project was always intended to not just be something to look at, but somewhere to participate. Meghan: How was it put together? Do you have any pictures of the framework before you stretched the fabric? Sophia: The structural design was one of the biggest challenges of the work, but became a strong driver in reformulating the poche experience of the space. When I arrived to the INVIVIA gallery, I saw the polished concrete floor, brick walls, and a ceiling I was not allowed to touch, and at first, I was quite baffled as to where I would find any structural support. It takes two or ideally three people to hold the fabric in place while it is being attached, so the forces I was working with were not insignificant. This dilemma eventually led to the creation of a strong “thickened wall” scheme. 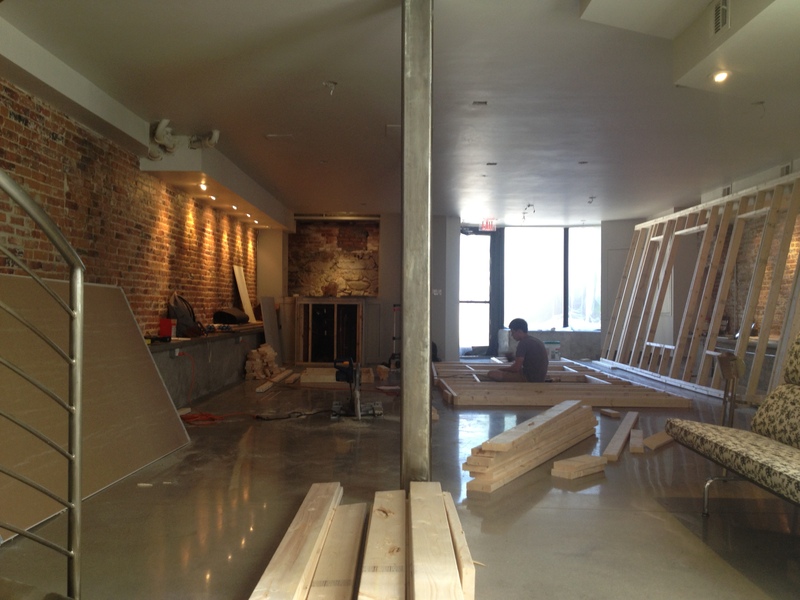 We grabbed onto some of the wood cabinetry and one of the steel columns to build three stud walls at an offset from the original rectangle of the room, creating a structural box, and turning the rest of the gallery into a poche of the installation. 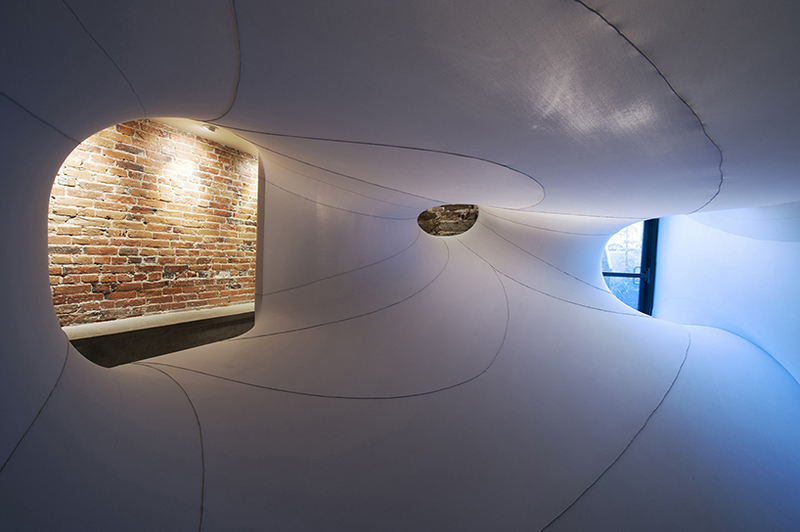 Allowing people to walk within this thickened wall to the exterior of the fabric womb provided the opportunity to create varied sequences of interaction with the piece. Someone walking by might first look through a frame and see the outside of the fabric form and then walk by another frame opening up into an interior view before encountering a doorway which finally allowed them to enter within the fabric or into a middle layer of poche between the stud walls and suspended form. Creating most of the structure from scratch also provided the opportunity to create the connections in ways which allowed the frames and apertures to clearly read as being extruded into the new interior. The fabric had its own wooden frames which were then hooked into insets in the stud walls or metal framing around the room. A flap of fabric wrapped to cover the metal connectors, allowing the connections to become invisible and the fabric to read as emerging directly from each orthogonal frame. Meghan: What’s next? Was this a site-specific installation or do you see it as a language that can take other forms? Sophia: This was actually the second of two large fabric installations I have made. The first was in a house gallery where I took over the living and dining areas. There was a really compelling tension that emerged out of the very apparent domesticity of the space being drawn into and contrasted to the new fabric forms. I would love to have the opportunity to resite this first installation into a wireframe skeleton or framing of an american home. The Invivia Gallery offered a new context to respond to; none of the domesticity, but a chance to strengthen other ideas which were just beginning to be realized in the first installation. One example is right at the entrance where people are able to look into the large storefront window and see a space they do not yet know how to enter, a room directly next to their entry from the door. At just one step into the installation, already there is a play between two spaces which encouraged further exploration. I was able to create much better interaction at multiple layers of poche due to the larger scale of the gallery and its strong connection to a public street. So, while the installations are designed to be site-specific, the ideas can be transferred and transformed between various environments. 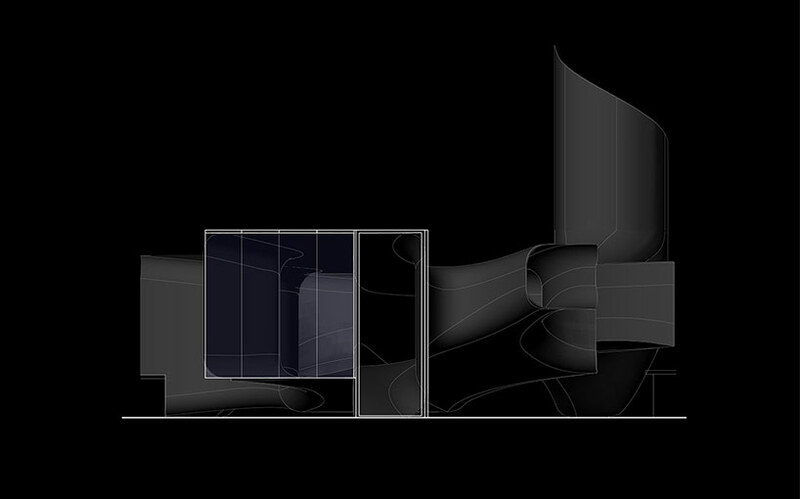 I can track the ideas of poche and spatial decoding back into designs I have done for buildings. Architecture is able to imply and reveal. It doesn’t require complex geometrical play to pique curiosity. One of my projects was essentially a cube, probably the furthest thing someone would imagine from the soft sweeping geometries of ‘Suspense’. A lot of recent building has become obsessed with being as transparent as possible and making the interior life of a building completely obvious. Perhaps in a time where most people are too distracted and rushed to notice or investigate, obviousness is what architecture needs; but after doing these installations and seeing people’s reaction to them, I sometimes wonder if buildings should allow more discovery and ask people to slow down and notice the spaces around them. As a child, whenever I went to a new hotel, I liked to go floor by floor and investigate the entire building, somehow always expecting to find some interesting space to see. I was rarely rewarded for the effort, but the idea of there being something to find made the buildings a heck of a whole lot cooler. I’ve since given up on the idea that all buildings might reveal something worth discovering, but sometimes they do, and when its a surprise it somehow makes the experience even better. Though not necessarily in the same form, I hope to continue this project in future installations and architectural work. Meghan: Could you imagine it as a larger, self-supporting structure? Sophia: There’s something about recreating the apertures of a space by linking directly to them that seems necessary to fully reinterpreting the existing structure, as the context itself becomes part of the installation. Seeing out of the fabric womb through a bay window to a typical streetscape is one example. That being said, by having the offset stud walls, ‘Suspense’ was largely self-supported and the gap between the frame of viewing and the original context of the gallery created moments where a person could actually appear in the frame. So a similar installation could certainly be self-supported, but the dialogue would become more about a zone held in-between the existing context and its intervention. 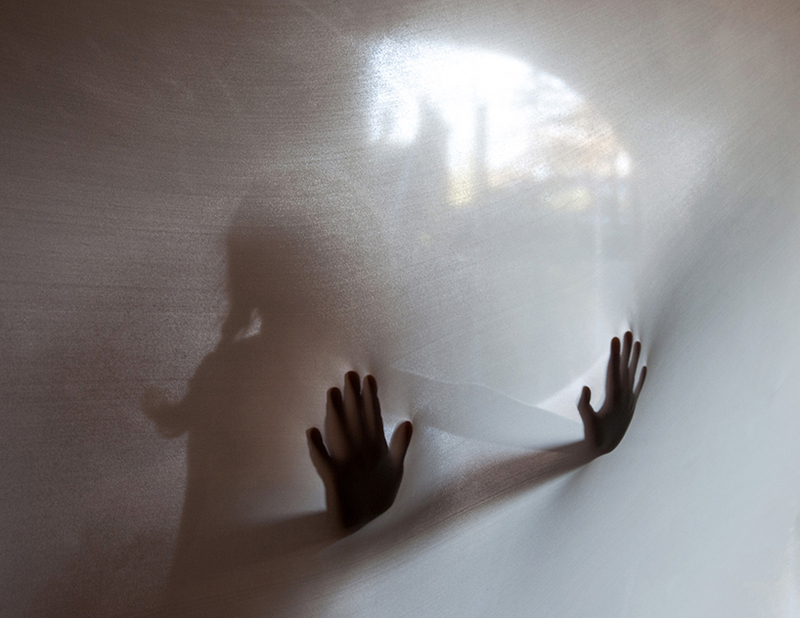 Meghan: I am really intrigued by the concept of poche in your installation- especially after seeing the image of the girl putting her hands up against the fabric. It’s really provocative! Can you elaborate on this a little bit more? Sophia: A lot of recent interactive installations rely on the feedback of software to create interactivity and engagement with participants. I’ve personally invested a lot of time into these technologies and use them extensively, but would also like to believe that interactivity can, first and foremost, be created through the formulation of spaces themselves. Poche is the method through which I achieve that in this installation. If you think about old palaces where the walls were often thickened to contain all the passages and stairs for servants to live in parallel without being seen, that inhabitable wall space begins to get at the type of poche space in which I am interested. Poche is often thought of as leftover space, but in these palaces, the poche contains a carefully calculated second realm which are integral to the first. Spaces exist directly next to each other, forming each other. They can be hidden, or revealed; and if one switches from being in a room to being in its wall space, the understanding of the initial space is changed. Wall becomes room and room becomes wall. In ‘Suspense’ there is a certain decoding that happens as people’s understanding of the space they are in keeps shifting depending on which layer of poche they are inhabiting. By creating a layered and changing experience, the poche enables and encourages curiosity and exploration. Many of the visitors to the gallery have described the experience as suspenseful even before finding out the title of the work. The picture of the child’s silhouette shows the intensification of this experience through the presence of multiple people sensing each other through the fabric walls and activating each other’s awareness of inhabitible poche spaces which were previously hidden to perception. With the flexibility of the fabric and tangency of all the spaces, people were constantly changing their own space and the space of others. It was exciting seeing how this promoted interaction between people through their own manipulation of their environment. Meghan: Where can we see more of your work? Sophia: For now, the best place to see my work is at my website (sophia-chang.com) but there may be a smaller scale installation in the works for this spring. I don’t want to give away too much, but I’m looking forward to using my work to support an event for the local community. Keep your eyes out!